In response to the waves of refugees from Africa and the Middle East arriving in the Italian island, Lampedusa, IBBY launched the project “Silent Books, from the world to Lampedusa and back” in 2012. The project involved creating the first library on Lampedusa to be used by local and immigrant children. This report by Debbie Beeks is a moving account of her recent visit to the library in March 2018. This is not an archetypal library, in time it may become part of the wider Sicilian system and have the ability of inter-library loans etc. But right now it is growing with, for and by the people who have it. 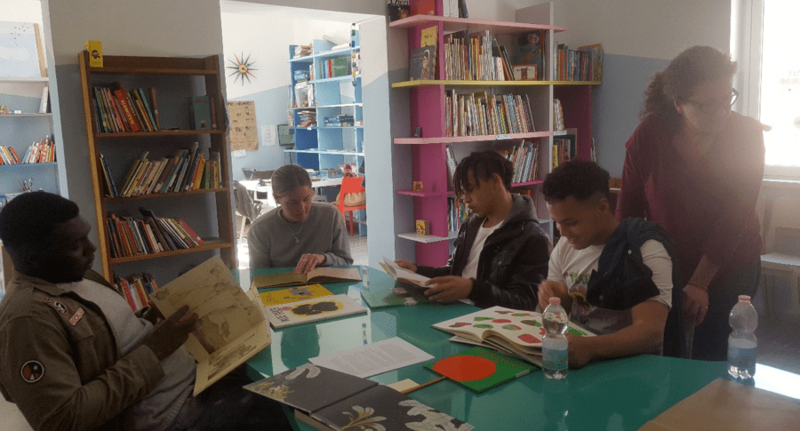 The IBBY Children’s Library is a grassroots community project, supported by the mayor, started with a collection of silent books and a conversation in a café. Over the years, volunteers and users have occupied and offered what they have and shared ideas. Confidence and enjoyment has grown into community ownership of the space. The culture that has emerged within the walls of the building is open and curious. An IBBY Camp is a week of visitors to programme events and engagement in the volunteer led children’s library. As a practitioner I am concerned with the empowering and inclusive spaces that books and creative engagement can create. I wanted to witness, without the media lens, the refugee crisis in Europe. I was curious about the power of silent books in communities of inequality and tension. What I discovered at the 6th IBBY Camp were gentle acts of humanising activism, a renewed definition of what a library is for and what it can do.